Pardot is a new kid on the block. So, in most cases, Pardot is implemented after initial business set up. Not surprisingly, there was life before Pardot. So, organizations have existing pre-Pardot era forms in their orgs that trigger Sales (Business) processes, Web-to-Lead (Salesforce) and Online Purchases (Online store). Once Pardot is implemented, a decision needs to be made about how to manage pre-Pardot era forms. But, before we proceed, if you are unfamiliar with Pardot Forms then, please visit my previous blogs. In these blogs, I will discuss how to create a form in Pardot How to create a Form that prospects actually want to fill out and I explain how to use Progressive profiling to streamline the Pardot Form process. In this blog, we will focus on the following: What is a Pardot Form Handler? ; And, when, where and why is it used? Completely migrate pre-Pardot era forms into Pardot Hosted Form. Use Form handlers to pass prospects data in Pardot. Let us take a closer look at the second option mentioned above – the use of existing form to pass the data to third-party applications. Under the second option, you may want to consider using a server-side post instead of migrating pre-Pardot era forms to Pardot. A server-side post occurs after the data has been captured by your existing form and posts the captured data onwards to a Pardot Form Handler. By using this mechanism, you can keep using your existing business processes intact without the need to migrate pre-Pardot era forms into Pardot. To setup the second option, you have to create a Form Handler in Pardot to receive the fields that will be passed through your existing web form. Once the data is successfully passed to Pardot Form Handle, the prospects are tracked by Pardot in the similar fashion as if the information has been submitted directly through Pardot Hosted Form. Whether you use Form or Form Handlers, Prospects will be tracked by Pardot is the same manner; unless and until, Prospects delete the browser cookie or enable Do Not Track feature in browsers feature. 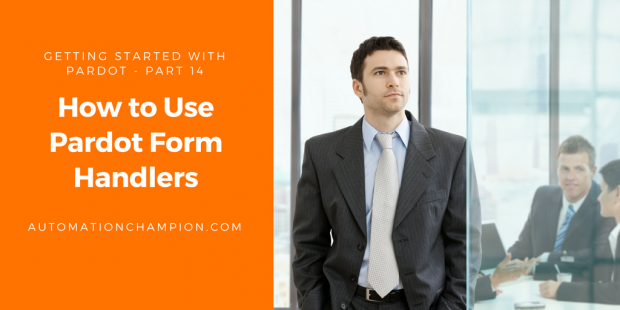 Before we look into a business scenario, let us review the difference between Forms and Form Handlers by reading this article How to create a Form that prospects actually want to fill out. Scenario 1: Pass the third-party web-to-lead form data directly to Pardot. And, do not pass the same data to Salesforce. This option is best if you only want to pass MQL (Marketing Qualified) prospects to Salesforce, but not all prospects. Scenario 2: You want to pass the same prospect data to both the systems, Pardot and Salesforce, once a prospect submits the third party web-to-lead form. We are going to use Salesforce Web-to-lead form as a third party form then, we will use Pardot Form Handler to pass the form data into Pardot. At the end, click on the Finished Button. Make sure to save HTML code on your desktop. Let us start with a business use case. David Haditsch is working as Content Marketing Manager at GurukulOnCloud. At GurukulOnCloud, they are using Salesforce web-to-lead form to generate leads from their corporate website. GurukulOnCloud’s web-to-lead form is heavily customized to represent their brand identity. As a result, GurukulOnCloud does not want to migrate Salesforce web-to-lead forms to Pardot Hosted Form even though Pardot Forms offer a wide range of features in comparison to a third party form. GurukulOnCloud decided, therefore, to use Pardot Form Handler. 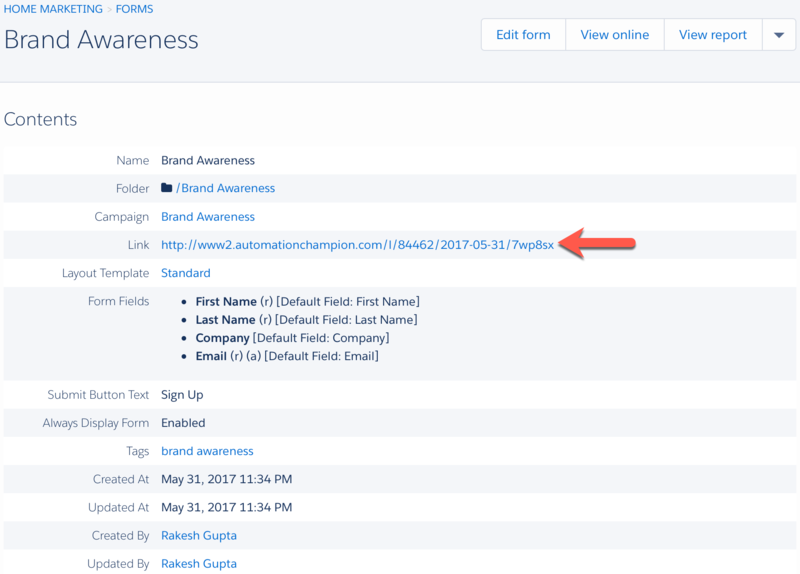 Furthermore, GurukulOnCloud wants to pass the prospect data to both – Pardot and Salesforce – once a prospect submits the third party web-to-lead form. As a Pardot Consultant, we are going to help GurukulOnCloud to implement Form Handler with Salesforce web-to-lead form. You can also enable Kiosk/Data Entry Mode (Do not cookie browser as submitted prospect). Make sure to select Enable data forwarding to the success location check box, as we want to pass the same data to Salesforce. Once Pardot receives the post, the exact same data will be transferred to the location specified as the Success Location. Use the URL mentioned in the preceding screenshot in the Success Location. In a similar manner, you can add Error Location, to specify what is displayed once third party form fails to pass the data to Pardot. The next step is to add these four fields into our Form Handler and correctly map it with web-to-lead fields. Optionally, you can add custom error message text under the Advanced tab. Once you are done with all the changes, the next step is to click on the Save Changes button. Repeat the step 6 to add other fields to the Form Handler. Make sure that these fields are marked correctly with web-to-lead form fields. Now copy the URL i.e. (www2.automationchampion.com/l/84462/2017-08-03/88l933) in my case, as shown in the preceding screenshot. At the end, save your web-to-lead form with name Web-to-lead.html (use .html extension while saving the notepad HTML code) on your desktop. Once done, click on the Submit Query button. –> When a visitor submits a form in Kiosk Mode, Pardot looks for prospects with a matching email address. If there are multiple matching prospects, the submission will be associated with the prospect that has the most recent Last Activity field value. If the prospect with the most recent Last Activity field value is in the Recycle Bin, then, the prospect will be undeleted. If, however, there are no matches found, Pardot will create a new prospect. –> If you do not want to pass the data to Salesforce or any other system then, do not select Enable data forwarding to the success location check box. In my next blog, I will take a deeper dive by showing you how to setup Tracker Domain.